Using ArcView 3.2, a serial killer/child abductor's residences are buffered against children recovered deceased. Three children have been tied to serial killers using DNA. A 2002 national study released by the U.S. Department of Justice's Office of Juvenile Justice and Delinquency Prevention (OJJDP) estimated approximately 204,000 family abductions took place in 1999. Forty-four percent of these involved the concealment of the child. In 76 percent, it was the intent of the abductor to prevent contact with the other parent; in 82 percent, the abductor intended to permanently alter custody. The study also estimated 1,682,900 episodes of runaway/thrownaway children took place that year. Fewer cases, but more ruthless and violent, involve those children taken by strangers who are sexually molested and killed and those children who go missing without a trace. With the enactment of the Missing Children's Assistance Act (MCAA) in 1984, Congress directed the U.S. Department of Justice's OJJDP to establish a private organization to act as a national clearinghouse of information on missing and exploited children. The National Center for Missing & Exploited Children (NCMEC) (www.missingkids.com), a nonprofit organization, was established in April 1984. Every day, 24 hours a day, NCMEC receives calls for assistance in searching for missing or abducted children from law enforcement and searching parents through its national, toll-free hot line (1-800-THE-LOST) in the United States, Canada, and Mexico. Since NCMEC was established, it has had an impressive recovery record. Through December 31, 2002, NCMEC has assisted with recoveries of more than 94 percent of the cases involving missing and exploited children and handled nearly 1.7 million telephone calls through the hot line. NCMEC now receives an average of 700 calls per day, of which more than one-third require the MCAA-mandated services. When a child is reported missing to NCMEC, the child is assigned to one of four main missing case typesendangered runaway (ERU); family abduction (FA); lost, injured, or otherwise missing (LIM); and nonfamily abduction (NFA). Currently, ERUs represent approximately 72 percent of the children reported missing to NCMEC; FAs, 22 percent; LIMs, 4 percent; and NFAs, the remaining 3 percent. To draw attention to the plight of missing children, a variety of tools disseminate the information about the child and/or abductor. After reports concerning missing children are "intaked" by the NCMEC hot line and its protocol requirements are met, a case manager in the Missing Children's Division (MCD) is assigned and provides technical assistance to the searching parent(s) and to the law enforcement agency investigating the case. Local law enforcement agencies, the Federal Bureau of Investigation, other nonprofit organizations, and parents might also receive leads. Staff analysts in the NCMEC Case Analysis and Support Division (CASD) work with the case managers to rank these leads for their investigative value. All leads received are disseminated to law enforcement. In 2000, hoping for support for the program, NCMEC contacted Esri, which provided software to help find missing children. When a child is reported missing as either ERU or a victim of FA, the custodial parent(s) provides NCMEC with information about possible locations where the child might be. For ERUs this might be the location where friends reside or an area that the child discussed wanting to go. For FAs this might include the abducting parent's present address, former address, or addresses of the abducting parent's relatives and friends. Staff of NCMEC's Missing Children's Division explore leads of a missing child's case for patterns. Leads are displayed using MapObjects. This information is entered into the NCMEC database and automatically geocoded with latitude and longitude. When leads of a sighting of a missing child are telephoned into the NCMEC hot line, the information is added to the case file, and as location information from the lead is input into the NCMEC database, it is automatically geocoded. Peg Flick, chief information officer, wrote a program in Java that runs as a background process on NCMEC's database server that "wakes up" every 20 minutes and ranks any new leads. If the lead location is within a certain proximity of any of the addresses collected from the searching parent as possible locations, these leads are automatically given a high rank. Case managers and their assistants use MapObjects software on their desktop computers to query each child's case for the geographic distribution of the leads. All lead locations are mapped in conjunction with the "missing from location" of the child as well as any location to which the custodial parent believes the child may have gone. These leads are displayed against a variety of layers that include states, counties, roads, ZIP Code boundaries, train and bus stations, and telephone exchange boundaries. Additional layers, such as parks and campgrounds, are planned. The visual display of these leads is searched for patterns, and a cluster of high-ranking leads in a given area could warrant a targeted poster distribution either by fax or mail to elicit additional leads. NCMEC also uses ArcIMS with a system called LOCATER. The LOCATER program was developed to hasten the recovery of missing and abducted children by providing law enforcement agencies with technology to rapidly disseminate images and information about missing children. More than 3,300 law enforcement agencies have a LOCATER system. ArcIMS is used on the LOCATER server to enable law enforcement agencies with the system to instantly identify other LOCATER systems. The agency can e-mail a copy of the missing child's poster to the selected LOCATER sites. Currently two staff members handle mapping for NCMEC. Flick and Geraldine Kochan, a research analyst in CASD, work together to either write the programs or map geographic information on missing children. A variety of maps is updated on a weekly or as-needed basis and made available on the NCMEC Internet and/or Intranet sites. 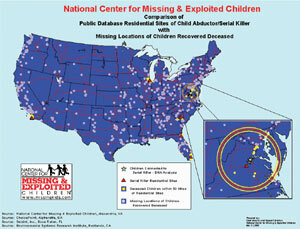 Some of these maps include NCMEC's America's Missing: Broadcast Emergency Response (AMBER) plan, weekly maps of children of NFAs and LIMs missing over an 18-month period, residential location maps of America's Law Enforcement Retiree Team (ALERT) representatives, and deployment location maps of Team Adam, the on-site response and support system that provides human and technical assistance to local law enforcement consultants. Maps that show the regional divisions of some photo partners that post missing children's posters, including WalMart and ADVO, Inc., are also displayed. Geographic mapping can also be used to assist in identifying missing or deceased child victims of serial child abductors and murderers. As serial child abductors/murderers become known, data layers of former residences and places of employment as well as the locations of known child victims can be compared with locations of LIMs and NFAs in the database. Using Esri Business Partner Geographic Data Technology, Inc. (GDT), route data with ArcView Network Analyst, known routes that the serial abductor/murderer used during travel are also displayed. With this information, NCMEC is now able to buffer around a specific proximity of serial abductor sites and routes and compile a list of children who are missing. Each missing child's case can be examined individually for correlating dates and circumstances surrounding it and forwarded to the law enforcement agency handling the case. NCMEC uses data from GDT in conjunction with Esri's ArcView Network Analyst extension for two analytical mapping projects that are near completion and involve children missing as part of FA episodes and ERUs. Based on a sample of NCMEC's recovered children, distances between the child's missing location and the child's recovery location have been calculated and correlated with the length of time the child has been missing. This information may soon enable NCMEC staff to understand mobility patterns related to missing children and better assist law enforcement officials in recovering missing children. Because NCMEC also handles international missing children's cases, plans call for expansion of mapping beyond the national level. Soon NCMEC plans to use ArcIMS mapping on the Intranet to give staff of the Missing Children's Division, the Case Analysis and Support Division, and others (approximately 2530 people in all) the ability to query and map all location information regarding a missing child's case, make maps, and e-mail them to the law enforcement agency handling the case. NCMEC also would like Congressional staff members to be able to query information about missing children from their state through the ArcIMS interface. 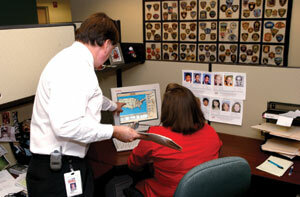 The use of GIS at NCMEC to recover missing children is in the early stages. Challenges exist for working on social issues at national and international levels, but NCMEC foresees significant benefits to be gained and is exploring ways in which the ArcView Spatial Analyst and ArcView 3D Analyst extensions will be useful and will contribute to the search for missing children. For more information, contact Geraldine Kochan, research analyst, Case Analysis and Support Division, NCMEC (e-mail: gkochan@ncmec.org).